Years of runaway growth have created surplus capacity. The choices now are tough. Driven by naïve assumptions about trend growth, a Chinese boom in production capacity fuelled by easy credit and state support leads to a global supply glut. Profits tumble as prices collapse. Chinese firms with excess capacity get into financial difficulties and risk insolvency needing more government support just to keep operating. Regular readers would be forgiven for presuming that Pacific Money was once again covering the twists and turns of China’s solar industry. 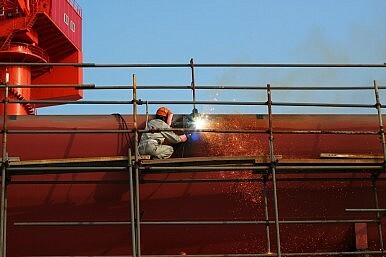 This time however, it is China’s shipbuilding industry that has gotten itself in difficulties. Like solar panels, shipbuilding has been held up as a strategic industry by Beijing – indeed, it has a longer history with that status. Preferential access to credit and other government support, as usual, has let the industry expand beyond reasonable levels. Mimicking the troubled solar industry, one shipbuilding company – Rongsheng – has hit the headlines first, but problems lurk across the industry and this company will not be the only one to face difficulties. In fact, it is estimated that up to one-third of China’s shipyards may be at risk as the world’s largest shipbuilding nation faces up to sales slump. In fact, the problem of excess capacity has an international dimensions, with shipyards in countries such as South Korea and Japan confronting their own challenges. The troubles at Rongsheng, which this week issued a profit warning, disclosed large scale lay-offs and revealed a request for government assistance, have been well reflected in its share price. The value of the company’s Hong Kong shares fell more than 20% over the course of last week. China has more than 1,647 shipyards but profits have been collapsing as nationwide output halved over the last 18 months. As usual in this country, the extent of support that the government (whether local or central) is willing to offer will be the crucial factor as yet another Chinese industrial sector faces the consequences of its unbalanced trajectory over the past few years. Right now, the need to scale down and consolidate the sector is running up against the usual goal of preventing any mass layoffs or unemployment. Rongsheng itself is the nation’s largest private shipbuilder, employing more than 20,000 workers. Last year Rongsheng posted a loss of RMB 572.6 million, and the company has issued a warning of another net loss in the first half of 2013. Yet the company’s failure to specify the exact amount has of course spooked investors, who may be presuming the worst. Justified though this may be, it is likely that the sector as a whole will face much more pain absent a massive increase in global demand for ships, or some sort of government rescue. New research shows that China supports its shipbuilding with massive subsidies.